Joel Schellenberger just started his first real job. He works remotely as a user experience designer for an educational consulting firm in New York. He makes good money, has a flexible schedule and loves what he does. It’s the happy ending that many university graduates hope for. But this is a happy beginning story for 19-year-old Schellenberger, who just finished his first year in the new User Experience Design (UXD) program at Wilfrid Laurier University’s Brantford campus. His “real job” is a summer internship, and if it’s any indicator of future employment opportunities in the field of user experience design, life after Laurier looks promising for the program’s inaugural flock of Golden Hawks. The program equips students with skills in design thinking, interaction design, information architecture, project management and entrepreneurship. Laurier’s UXD students also work directly with local companies and community organizations to create design solutions for their content, products, and service needs. Designing a product for a specific use isn’t a new concept, says Goodrum. Industrial designers have been doing that for decades. But designing the human experience with a product or service is a new concept, and as a field of study, its one that Laurier is leading. While other institutions offer courses in user experience design, Goodrum says Laurier is the only university in Canada that currently offers an undergraduate degree in UXD. The program, launched in September 2017, equips students with skills in design thinking, interaction design, information architecture, project management and entrepreneurship. Laurier’s UXD students also work directly with local companies and community organizations to create design solutions for their content, products, and service needs. Goodrum, who led the program’s curriculum design, is a proponent of real-world learning. To kick off the program’s fall term, she organized a field experience in downtown Toronto. Students spent time networking with user experience designers at Bridgeable, a leading service design firm, and later at Capital One, where Goodrum’s students received their first assignment. Ryan Chang, head of design for Capital One Canada asked students what Capital One can do to entice their senior clients to bank online. Schellenberger, who regularly helps his grandmother navigate her iPad, instantly connected with the assignment. Something that works better for everyone is what brought SHORE Centre, formerly Planned Parenthood, to Goodrum’s classroom in September. The sexual health organization was looking to encourage more young men to consult health resources on their website. At health fairs and community events, SHORE staff would usually host an information table, making resources and complimentary condoms available. But walking up to a table at a public event and taking a condom is an awkward experience for most young adults. During a 12-week period, a team of Goodrum’s students worked with SHORE and their target demographic to ideate, design and test prototypes to improve the experience of obtaining sexual health information. The end result – an interactive condom voting machine – made SHORE “over the moon happy,” says Goodrum. The prototype features a screen that displays a health-related yes-or-no question. Users can cast their answer, or vote, by taking a condom from the station’s yes column or the no column. To find out the answer, users scan the unit’s quick response (QR) code which takes them to SHORE’s website. From here, users could download a mobile application, which Schellenberger has designed, to keep smartphone-savvy young adults connected with reliable sexual heath information. SHORE plans to seek funding to further develop the prototype. For Goodrum’s students, working with real clients and real users reinforces the importance of approaching a problem form a design-thinking perspective. Design thinking is a creative, human-centred approach to problem solving and the keystone of user experience design. “Approaching something from a traditional damage-control standpoint doesn’t always work. You have to step out of the box, think from multiple perspectives, and design in an inclusive, solution-based format,” says Schellenberger. 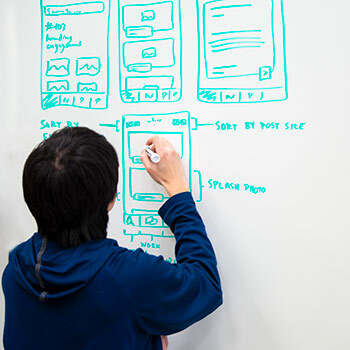 First-year courses in design thinking, information design and graphic design prepare students for approaching large-scale client projects; regular project reviews and touch points with current industry experts at Bridgeable and other UX firms complement teaching from Laurier faculty members. Goodrum plans to collaborate further with Bridgeable during the 2018/19 academic year in addition to projects with Communitech, Ontario Digital Services, Syngli, Needless and Fluxible. Schellenberger, thrilled to be working on a product that will soon launch in-market, is looking forward to September’s courses on interaction design, information architecture and three-dimensional prototyping in the campus maker lab. “I want to get my hands dirty,” says Schellenberger.